A friend (thanks, Richard!) has just sent me an article about a London-based art installation on neutrinos called ‘Super K Sonic Booooum’ that was exhibited at Shunt, inside London Bridge Station, in November. 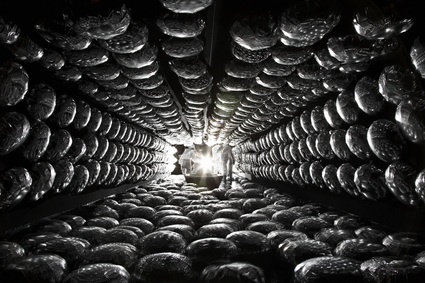 Inspired by the Japanese neutrino observatory Super-Kamiokande, the artwork by Nelly Ben Hayoun seeks to engage non-scientists with, as the article calls it, ‘arid, hard-core physics’. Arid it is definitely not, considering the amount of water that was used to illustrate the ‘sonic boom’, an analogy for the process when a neutrino interacts with an electron. This sounds like a pretty amazing idea! As I travel through there at least once a week, how could I have missed that?! Anyway, according to the article, the artist is giving a talk in London on 11 February 2010. While this sounds like another chance to make up for this missed opportunity, there is one hitch: you have to be a member of this ‘design futurist’ group called ‘Alter Futures’ which has a ‘by invitation only’ membership policy. Hmh… well, if you hear of another way of attending this talk, please let me know! This entry was posted in Events and tagged Nelly Ben Hayoun, public engagement with science, Super K Sonic Booooum, super-kamiokande by Angela. Bookmark the permalink.